DAME 2 Released – My Favourite Game Map Editor! Although I’ve been beta testing this for a while now, Charles Goatley today officially released DAME 2. 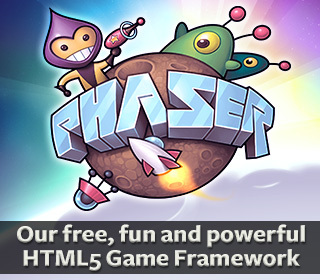 I first started using DAME back in September 2010 when the first version was released on the Flixel forums, and it has gone from strength to strength since then. Charles has done a wonderful job keeping on-top of bug reports and dealing with feature requests, and v2 is easily the single biggest update yet. DAME is a traditional 2D Tile Map Editor running on Adobe AIR, which means it works across Windows, Mac and Linux. The map editing view is generated with Flixel, so if you use it for a Flixel game you know it’s going to look exactly the same as it does in the editor. It has a comprehensive export system and custom scripts can be written in Lua. From simple CSV or XML data to writing out fully blown AS3 classes. Certain windows (tile palette, sprites, layers and properties windows) are now dockable. Isometric tilemap support – support for diamond, staggered diamond and skewed. Tile matrix and brushes all still work as expected with these layer types. Tiles can be stacked on top of each other. Improved visuals for selected tiles. Improvements to drawing on tilemaps. Can draw lines on tilemaps. 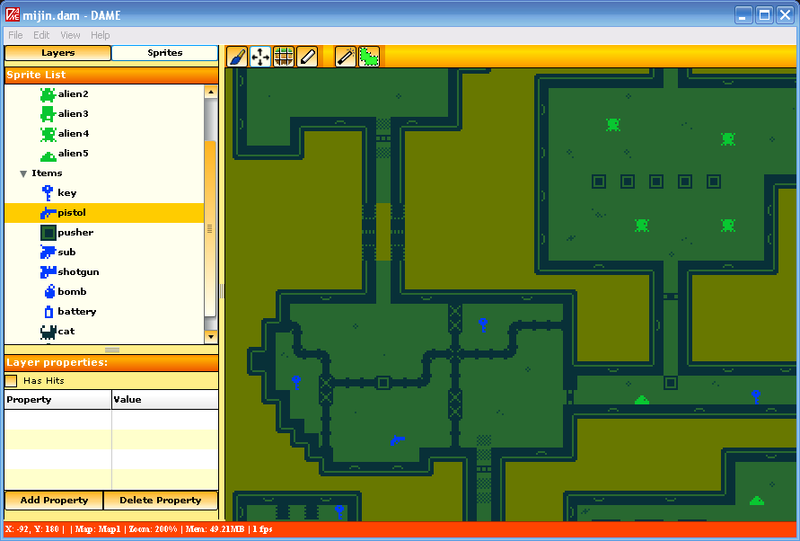 Can select, move and scale regions in tile drawing mode. Can copy and paste in tile drawing mode. Right click when drawing brings up context menu. New configurable 16 colour palette for drawing. Can have per tile properties. Can repeat tilemaps on individual axes. Can use any system font for text boxes. Can use bitmap fonts for text boxes. 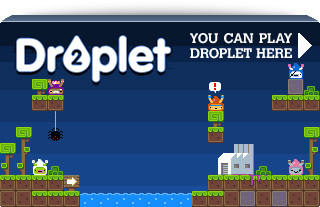 New Sprite Trails – automatically populate a path with a series of sprites. Sprites can be automatically sorted for depth. Sprites can use a Z value for height placement. All object layers can be aligned with an isometric tilemap layer to allow exported positions to be relative to the tilemap’s ‘real’ coordinate system. Aligned shapes on shape layers will rotate/skew to fit the tilemap shapes. Can change the frame for any sprite to be different from the sprite entry. 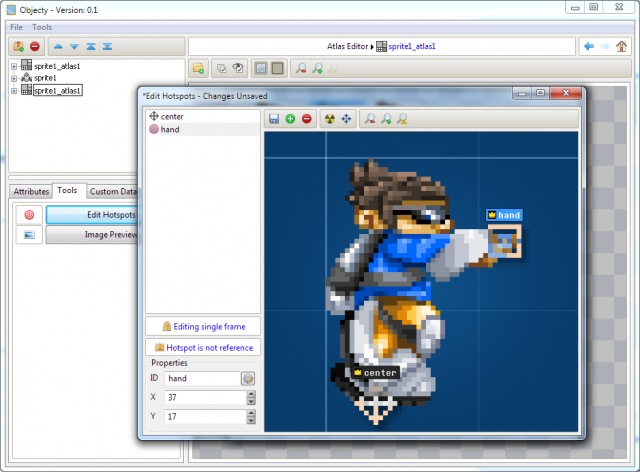 Tile sprites are now spritesheets – can scale and translate the image within. Can rip an image to create a tilemap layer and tileset. Choice of themes for DAME. Importing dam projects with sprites improved to find pre-existing matches in current project. Can save sprite entry lists separate to a .dam project as a .dsf (DAME Sprite File), allowing you to have multiple sharing one list of sprites. Can move an entire group in real-time. More of the session is saved in a .dam file allowing you to resume editing where you left off much easier. 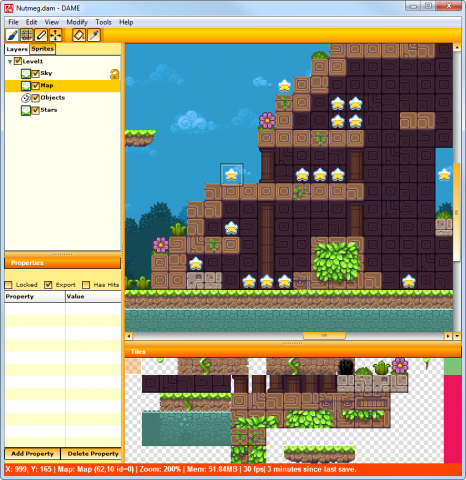 Tiles now preview in tilemap layer properties window. Can gives shapes different colours. DAME isn’t just for Flixel. There are FlashPunk exporters included, and the CSV/XML export makes it easy to use in languages other than AS3. I create all my game maps with this program and look forward to making even more with v2.